Piano is developed by connecting a 555 timer ASTABLE multivibrator with variable frequency to a speaker. 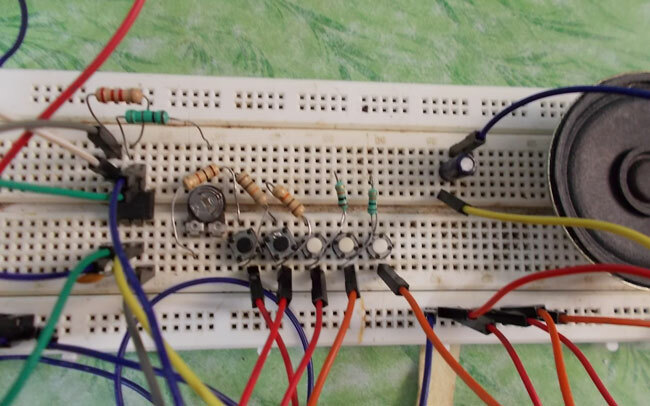 Piano is a wonderful musical instrument and one can make a cheap one using 555 timer IC chip. This concept of piano is achieved by making the timer generate 5-15 different kind of sounds. The different sounds are generated through timer by allowing it to run as free running mode or astable mode or square wave mode, with variable frequency output option. Before going for circuit, one should understand how the frequency output of square wave generated by free running timer can be changed. The pot is to adjust for a pleasant tone. The 10K resistors can be replaced with any kind of resistances depending on the convenience. thank u very much for this nice subject . but there is something i don't get it? in the circuit diagram explanation are you sure about the (left button)? what i see when pressing the first button on the left is that all the 10k resistors will be included to the connection (effective resistance) ?? question2: is it important to have the 100 ohm resistor (the one series with the POT)? question3: what is the mode of the 555 timer operating here?? 1. Yes, all 10k will be added when pressing the left most button. 2. yes, its important, so that resistance between 6 and 7 never goes to Zero. Hey my piano circuit made as given do not sounds clear .What should I do for it? i have a piano yongmei 6300 for eleven years since 2006. it had a problem and i need to fix this if you can help. all small wires has been cut by rates and i can not easily sold them back, so i need a help , a schematic board on how to remix the wire back so that it can work again. is it 2K2Ω ? or 22kΩ?? is must be 22k right? 2.2KΩ which equlas to 2200Ω as rightly pointed out.